The world’s toughest and most waterproof motorcycle rear top case system used by thousands of adventure riders all over the world. Made in USA. Complete and easy to assemble, each system includes a tough and waterproof black SKB case, waterproof lid lock, Caribou adjustable quick attach/release hardware with lock, aircraft grade powder coated aluminum cargo plate, bike-specific mounting hardware, and photo instructions. No modifications to the bike. Case is pre-drilled with lid lock pre-installed. Super Tough SKB case material with a heavy duty watertight O-ring lid seal - will not crack like hard plastic, will not dent and leak like aluminum cases, and far more secure compared to soft bags. 40 Liter (2,441 cu/in) capacity is the largest we offer, but no wider on the bike than our other cases (only height and length increase). Case dimensions are approximately External 55.9cm (22") x 47cm (18.5") x 21.6cm (8.5") and Internal 52.1cm (20.5") x 39.4cm (15.5") x 19.6cm (7.7"). The Original SKB Top Case for the BMW F700GS and F650GS Twin. Made In USA. In Stock. The Original SKB Top Case for the 2013 and newer BMW R1200GS. Made In USA. In Stock. The Original SKB Top Case for the Honda Africa Twin CRF1000L. Made In USA. In Stock. The Original SKB Top Case for the 2011 and earlier Suzuki V-Strom DL650. Made In USA. In Stock. The Original SKB Top Case for the 2012-2016 Suzuki V-Strom DL650. Made In USA. Made In USA. In Stock. The Original SKB Top Case for the Triumph Tiger Explorer 1200. Made In USA. In Stock. 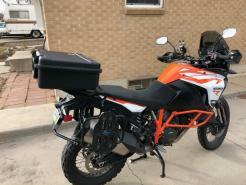 The Original SKB Top Case for the Yamaha Super Tenere XT1200Z. Made In USA. In Stock.